Scroll down to read Chapter One for Free! Nakala’s fourteen year old son does the unthinkable, he commits suicide throwing her family into turmoil. Seeking answers to her never-ending questions surrounding his death she attends a series of spiritual events, leading her to a two-day work shop on advanced dowsing. 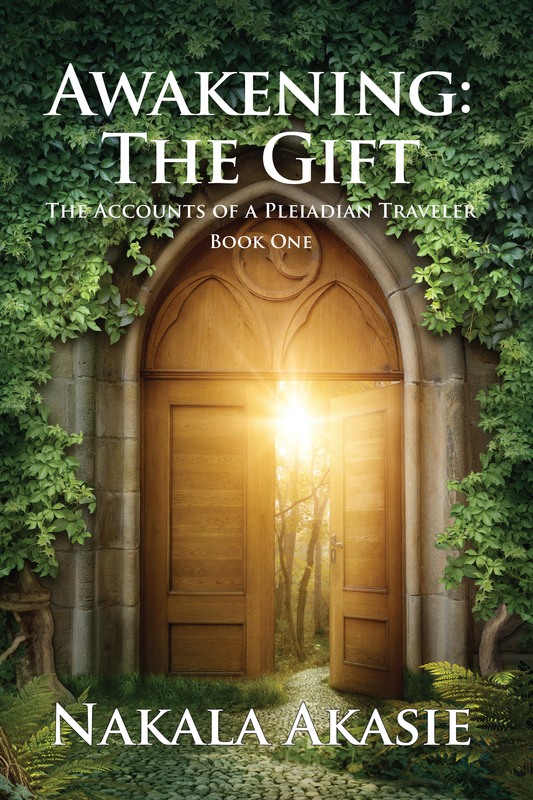 Soon after the workshop, Nakala begins to receive telepathic communications and to channel a group of Pleiadian beings called the Akasie, other masters, archangels and even departed loved ones, including her son. The Celestial Beings comfort and teach Nakala by infusing her with waves of uplifting energy: Love, answering questions connected with her son’s passing, and introducing her to the universal laws all in preparation for the coming transitions. As Nakala begins to integrate the teachings she is faced with another set of crucial challenges concerning her everyday life. 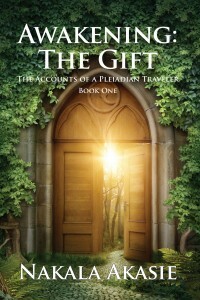 Would people believe her if she revealed her newly acquired spiritual gifts? Relationships with family and friends literally hang in the balance as she learns to establish and maintain important boundaries and to reconnect with her heart’s promptings. As it happened, I was in the kitchen doing the last minute clean up from breakfast before heading out the door to drop off the kids for school when out of the corner of my eye I caught a glimpse of dark reddish-brown streaks on the inside of my eldest son’s wrists. Were they cuts? Three days remained of school and we had all been looking forward to watching movies late at night, sleeping in, going swimming, and camping out in the mountains. But life, as I have learned, has a way of shifting on a moment’s notice right before you reach that place that you really want to be. A day earlier I had received a phone call from the junior high school counselor, Mr. Higgens, who had earned a reputation for not being the most understanding and kind person. How he had gotten the job as a school counselor I had always wondered. He informed me that we had an unpleasant state of affairs concerning my eldest son and of the consequences thereof. Mr. Higgens had been abrupt, his manner void of compassion as he had driven his point home, “Bradley’s grades are unacceptable and therefore he must be enrolled in summer school before he will permitted to pass to the next grade.” He had paused momentarily before adding in a subtle yet condescending tone, “He, of course, will be expected to earn acceptable marks,” like I hadn’t known that. Temporarily stunned, I had gently set the receiver down on the cradle. The phone call had left me feeling disappointed. The more I thought about it, I realized that I was angry that our summer months would be disrupted because of my son’s choices. I felt cheated. I had worked outside the home since my youngest son was two years old. I had quit work to stay home with the kids… for reasons that will become apparent as you read. It was my first summer that I had home with the kids. Even though I had worked outside the home for years, I still had hauled these kids to and from school. I had been looking forward to some down time. I wanted a rest from it all. It seemed to me that my time off would never arrive. I was angry all right. It had been a good thing the kids had been in school when the call came in because I needed time to sort this through and let the anger dissipate—to make a plan. After some reflection, I had to admit that part of this was my fault because I had known that Bradley’s grades had been slipping for some time. I had seen a steady decline in them every nine-week period to the point that I dreaded when the grade cards came out. I had hoped that Bradley would bring them up before the year had ended. Yes, I had chided myself; there were the obvious signs that he had just been skating by. Unfortunately, I had only chosen to verbally reprimand him for not keeping on track with his studies and let it go. I should have taken a firmer approach, but I thought that it was a passing phase… I had reasoned it would be better not to push him and let him find his way. So many kids go through times like these, I thought. Over the school year, I had watched Bradley withdraw—growing temperamental—more sullen. I hadn’t known what to attribute his mood or his behavior to. With little or no provocation, Bradley would swiftly fly into a belligerent rage that was often directed toward his two younger siblings. I swallowed hard as I recounted the times when I had not been able to protect my children from their brother’s abusive outbursts. I had decided to quit my job so I could watch over them more closely. I reprimanded myself saying that I would no longer allow myself to turn a blind eye. Something was troubling Bradley. It was time to face it… past time to face it, even though I didn’t know what I was facing. The evening of the phone call from Mr. Higgens, I had approached Bradley and had candidly laid out the facts as I knew them. There wasn’t all that much to it. He had failed two classes and had to make them up. He had to attend summer school. End of story. We talked about some real consequences to his actions but hadn’t come to any solutions that felt comfortable. So we had left it all up in the air. Bradley had not had any solid punishment or direction given to him. Perhaps summer school was punishment enough. For months, I had felt that, as a family, we had been walking on something akin to a rocky crag or precipice. The edge had been sharp, jagged, and precarious. In places the rocks were beginning to break free—separating from the other rocks and falling, hitting, and breaking as they traveled downward out of control. I had compared my entire family to the rocks: if we shifted in any one direction a little too much we might easily lose our balance and fall, breaking into a thousand pieces before any of us could find a way to stop the momentum. The entire year, we had struggled to maintain peace by what I had thought had been clever at the time: we simply headed off any angry outbursts by redirecting the subject to something more pleasant. This meant we had to be alert at all times and extra careful around Bradley. We hadn’t wanted to upset him. However, the probability had been strong that sooner or later we would make a wrong choice, sending him into a rage that couldn’t be turned back. Our lives, like the rough rocks that had loosened, would have nothing left to hang onto—to brace us from the fall. My children, all of them, had suffered somewhat from my lack of attention concerning Bradley’s schooling as most of my concentration had been centered on keeping peace in the household instead of on his grades… on what was troubling him. My thoughts suddenly took a front seat to how much of my energy would be used to see that Bradley got to and from summer school and making sure he completed his assignments. Long gone were the dreams of a leisurely summer. Well, I shook my head in defiance, there is nothing I can do to change this unfortunate set of circumstances. I figured it would be best to focus on the free time we, as a family, had left of summer instead of what glared in our faces: summer school. As I made peace with the situation I dug deeper. The grades along with his attitude had merely been signs, a symptom of something that was disturbing him. What could have been that awful? Not only had Bradley not applied himself in school, but also his actions had become reckless—his choices were dangerous, against the law, and life threatening. A few weeks earlier, I had had the misfortune of playing hostess to the sheriff and then a few days later to the two representatives of the Santa Fe Railroad, which ran near our home. It seemed Bradley had gotten himself into trouble. There was an investigation being conducted. I listened and had pondered my choices, weighing them all carefully. Thinking Bradley needed someone to confide in and direction, I decided to take him to see a therapist. He certainly wouldn’t talk to me or to his father about what he had gotten into. What was the root of his agitation? After what I had thought had been a thorough evaluation by the therapist, it was recommended that Bradley see a colleague, a psychiatrist, Dr. Greene for another evaluation for ADD (attention deficit disorder). Then Dr. Greene promptly convinced me that the desired action would be to put him on medication. Bradley, then fourteen, was enrolled in the eighth grade. My two younger children were both attending the grade school. The day after the phone call—the day after I had talked to Bradley about the repercussions of his behavior was the same day that I caught a glimpse of the inside of his wrists—the streaks of dark red. My voice, with suspicion and dread, rose to a pitch I didn’t readily recognize. I faced Bradley and commanded him to turn his wrists over so I could get a better look. My mind went into hyper drive. What had happened? Did he require medical attention? Without resistance, Bradley complied, as if nothing was wrong. There were several cuts on the inside of each wrist that were razor thin. The cuts were deep enough to have bled and scabbed over, but had not been life threatening. I was flabbergasted—afraid of what this meant, and I lost my composure. Pointedly, I asked him what had happened. Bradley’s reason for the injury was flimsy, having no merit whatsoever. Void of emotion, Bradley’s response was that he had been on the roof of our ranch-style home and as he climbed down he had slid down over the gutter. I didn’t buy his story. What had he been doing on the roof anyway? I didn’t believe him. Without hesitation, I reached for the phone and dialed the emergency number for the therapist only to have the answering service pick up. Distraught and desperate, I left my message, concerned that critical hours might pass by before he would get back to me. However, in less than five minutes the therapist returned my call. Somewhat relieved that I had someone with expertise to confide in, I told him what I had seen and repeated my conversation that I had had with my son. “Of course, I will see to his care,” the therapist assured me before adding, “However, Dr. Greene should know what is going on. I am sure Dr. Greene will want to admit Bradley so we can watch over him properly. I will notify the doctor immediately.” Admit him? With his words he had intended to relieve my apprehension; instead though, I felt the anxiety quicken and build. My heart grew heavy as I heard myself agree to his recommendation. That morning marked the beginning of the end as my son was admitted to the hospital for a mental assessment and observation. In hind-sight, I know now that this action had weighed heavily on my son, creating feelings of doubt, being unloved, not being good enough, not being understood. In essence it had created a stigma that would weigh heavily on my son for the rest of his short life. The emotions had been palpable. Bradley no longer trusted us. He no longer trusted anyone. In retrospect, I am able to see it clearly. It was as if we had been writing a book—Bradley’s book—and this was the very last chapter. I could see that each person in his life—his brother and sister, teachers, therapists, police, emergency medical technicians, doctors, nurses, family members, friends, kids on the school bus, our neighbors, and even his dog, Kurt—had been characters in his drama! The thing was, the plot had been written by Brad’s actions, or reactions, to what other people had said or done to him. The narrative had been written moment by moment with each thought, feeling, and action in response to what other people did. Some of the choices people made had made a direct impact on Bradley’s decisions; others had not. The main character, Bradley, had full control—the final say on how the plot evolved and the story ended. I saw how even one phone call had made a huge impact on Bradley’s life and how it had created a snow ball effect that led to a series of unfortunate choices—choices that no one could change, not ever. But really, why had Bradley been so angry? Why did he do these things that were so dangerous? As parents we had a certain amount of control, or so it had seemed. Perhaps that was what Bradley wanted to show us… we were not in control. He was not to be controlled! As I looked at the situation more closely, I saw that everyone I knew had tried to support Bradley. He had been in a rough patch for sure. Everyone concerned had been following Bradley’s lead. We all were involved and in a way, somewhat responsible for what had happened. All the players had waited for their cues. According to the actors’ beliefs and how well they controlled their thoughts, emotions, and actions, they had contributed drama…substance to the story. Most all who were playing their parts in the delicate but paramount scene had been doing so unconsciously: not aware of how important their interactions were with Bradley and the decisions they made concerning him. Unfortunately, as if on auto-pilot, many of the people who had influenced the outcome of this particular scene in Brad’s life (Brad’s choices) were teachers and doctors who work with scores of people each year, many of whom were working from a text-book mentality and not from their hearts. In other words, the choices were made without looking closely at the entire picture: Bradley’s feelings. Some of the choices had been irreversible, having such a massive impact on how the scheme of it all played out. Many of us were left exposed and vulnerable and to a larger degree, as a result of the choices made, were shattered…unable to escape the nuances of life’s greater mysteries: life and death. There seemed to be no sure way to finish this chapter of Bradley’s book or for any of us to walk away a winner or even minutely unscathed from life’s theater, as we all had been locked into the drama as we set about making our own choices. As sure as the sun rises and sets, by his own volition, he made his choice and he himself wrote the last line. For the main character, Bradley, there was no account taken to how we, the supporting actors, would follow his lead as he wrote his thoughts and feelings down on the pages with color and flare in one irrefutable gesture like he had literally taken his hand and swept it before us to banish us all out of his way—out of his sight. His thoughts were intrinsically fueled by fear, anger, and hate that ultimately dominated. He wanted to remove us from his story. Or was it the other way around? Had he wanted to remove himself? No matter how many times I replayed the scenario of Bradley’s last days I was not able to make sense of it all. After the tedious affair of the funeral service, hearing each person offer their sincere condolences, and seeing to the final effort of laying his body to rest, I began to grieve in silence. I didn’t want anyone, especially my children, to see me scream, or cry, or cling to my husband for dear life. The loss of my son left me in absolute torment. In secrecy, as if I were replaying a TV broadcast over and over, and unmercifully, I saw the last week of his life leading up to his “death” over and over. I was unable to shut down the images, the thoughts, the emotions, or my incessant questions. The scene continued to present itself over and over as if it were the very first time—fresh, alive, and absolute­—holding my mind in torment every moment of each day and night. Never did the episode change. I was unable to sleep, so I called my doctor asking for sleeping pills. Even they did not ease the agony or facilitat a single restful night’s sleep. My tears spilled over, my eyes burned, my throat was raw, and my head ached. Mentally, emotionally, and physically I was spent. I was no longer the same person. Yet outwardly, I persevered, taking charge of my family and continuing to fulfill my duties as a mother, wife, and homemaker. Inwardly, I ached. My family was no longer complete, intact. My eldest child was gone, leaving a huge, gaping hole in my life. Everything I saw reminded me of Bradley: his room, the TV, the school, school buses, the hospital, the church, cemeteries, grocery shopping, cooking, even setting the dinner table—triggered me—evoking emotions that I wished never to feel again. So I pushed past it all and pretended I didn’t see or feel, hoping that it all would just disappear and release me from reliving the pain. For weeks people offered their support with sympathetic gestures by sending cards and flowers, speaking thoughtful words… What did they know? How could they know? I knew they just wanted to be kind, but why did they insist on reminding me of it? I wanted to forget! Superficially, I smiled and thanked them. Secretly, I grew frustrated and angry that I had yet again been reminded of my pain, my son who was gone… forever. Going into deep introspection, I began to ask questions, hoping to find the answers that would somehow ease my mind… fill my heart with comfort and peace. Over and over, I relived every word, every scenario, working to find the magic answer to what had gone wrong. My thoughts drifted back time and time again to a sermon I had heard as a young girl. The Baptist preacher had been quite charismatic and persuasive, driving his point in deep during one of his sermons classifying suicide as the ultimate sin. He had stated with such profound authority that if a person ended his or her life, they would be cast into the fiery depths of Hell. The scene had been deeply embedded into my young impressionable mind. Why had Bradley chosen that path? What if I had done something different? If only I listened more closely. If only I had asked more questions. Then other questions came. What had happened to the soul who had inhabited that body? Where had it gone? Did he vanish into thin air? Had he gone to hell like the preacher had stated? Is someone (a relative perhaps) looking after him in the spirit world? Exactly what had happened to him? No matter how many questions I came up with, I refused to believe that Bradley had gone to this place of torment or simply had vanished—that he no longer existed on any level. I was his mother, after all, and I wanted—no—needed peace of mind that he was somewhere safe and being attended to.